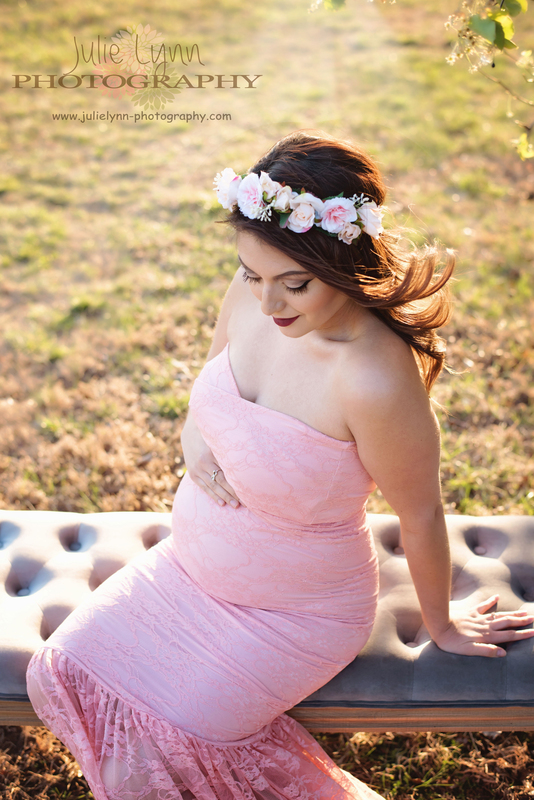 Whether you just want to take better photos of your pregnant wife or you're an experienced photographer trying to make it in the maternity photography industry, you have to start somewhere with learning how to make better maternity portraits. In many cases, traditional portrait photography tips apply. 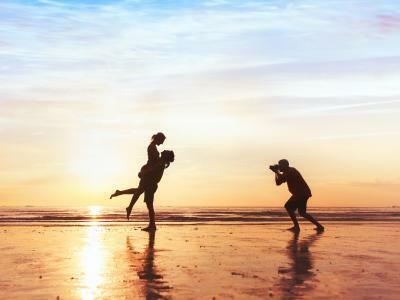 By that I mean that you want to put the subject in a comfortable pose, avoid using wide-angle lenses which distort facial and body features, and use natural light when possible. But when your subject is a pregnant mom-to-be, you need to think about a few other things, too. Pregnancy is a beautiful process with many not-so-beautiful moments along the way (morning sickness, anyone?). As a result, even the most gorgeous women will have moments during their pregnancy when they don't feel beautiful in any way, shape, or form. Your job is obviously to make her look her best, but you need to make her feel her best too. That means giving mom a lot of compliments about how she looks. After every few shots, give her a positive affirmation about how she's glowing, how the light picks up her eyes, or even on how she's doing with posing. Compliment her on her attitude, her willingness to work with you from shot to shot, and on her wardrobe as well. The point is that for you to help mom look her best, you need to put her into a mindset that she really does look great - even if she initially doesn't feel that she looks good. The power of positivity can go a long, long way! Shooting from a low camera angle can make mom look bigger than she actually is. And though you want to highlight the baby bump, you don't want to highlight the bloating, weight gain, and double chin that's likely afflicted the mom-to-be. You can avoid this by using a high camera angle. Not only does this help to slim the model's face, but it also gives you a chance to take a photo from an interesting angle that leads to a more eye-catching portrait, like the one above. A sharp, downward angle of view won't give you the best view of the baby bump. Instead, strive for a view that's slightly above mom's head with her arms positioned around her belly, as seen above. Another alternative would be to angle the shot at about 45-degrees so you can get a profile of her belly. 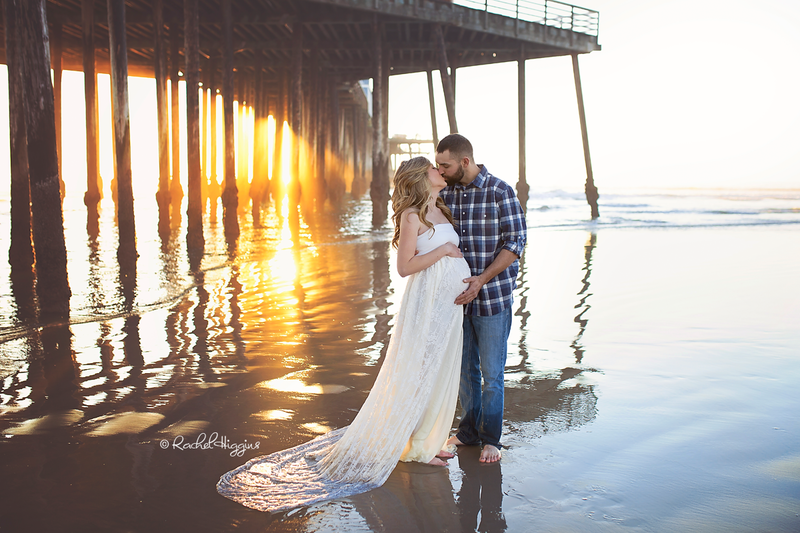 Either way, having her wear a form-fitting, gorgeous maternity gown will help accentuate her baby bump for the photo. 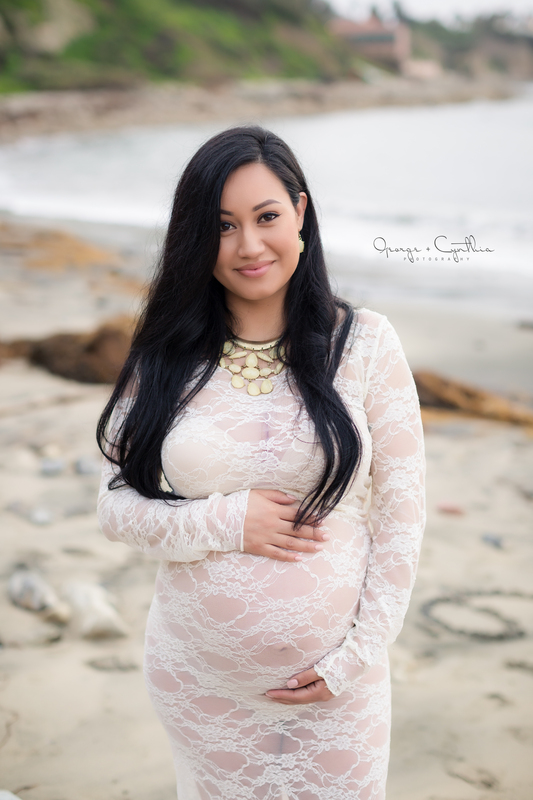 If you shoot on a full frame camera, a lens like a 35mm, 50mm, or 85mm lens is an ideal choice for maternity photography. On the wider end, the 35mm lens allows you to take a wider shot without worry of distortion that occurs with wide-angle lenses. 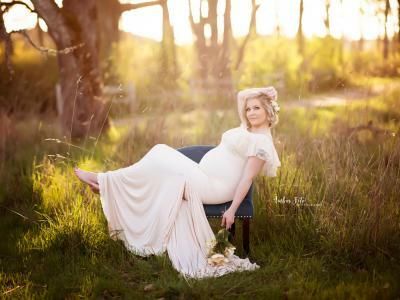 This is a good choice for documentary or environmental maternity photos like the one seen above in which you want a bit of the wider seen and a better view of the wardrobe too. A 50mm lens is a good choice as well because it's small, lightweight, and very versatile, allowing you to get up close for more intimate shots and back up for wider shots as well. An 85mm lens as the focal length to allow you to really step back from the model and still get tightly framed shots. If mom is a little uncomfortable in front of the lens, this is a good choice because it allows you to put some distance between you and the model. If you shoot with a crop sensor camera, remember that the crop factor changes the effective focal length of the lens. The crop factor depends on the manufacturer, but Canon crop sensor bodies have a 1.6x crop whereas Nikons have a 1.5x crop. Essentially that means the 35mm, 50mm, and 85mm lenses discussed above act like 56mm, 80mm, and 136mm lenses on Canon bodies and 53mm, 75mm, and 128mm lenses on a Nikon. With a longer effective focal length, you can more easily get close up shots from a greater distance. Again, this can be advantageous if the mom-to-be is a little uncomfortable getting her photo taken. 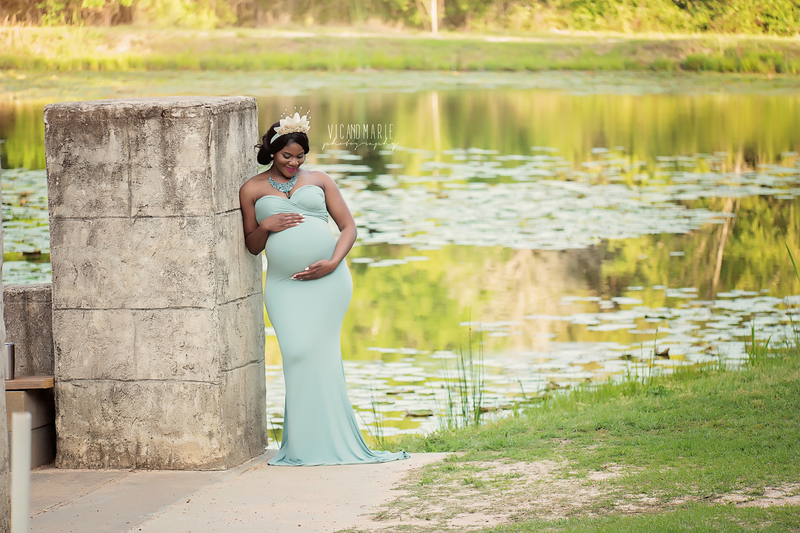 A pregnant woman's arms can either be a help or a hindrance to you as you compose your shots. On the one hand, get the positioning of her arms just right and they can help give her a slimmer appearance while bringing more attention to the baby bump. On the other hand, get the positioning wrong and you can have an awkward pose that not only makes mom look bigger but can also make her look uncomfortable too. A classic arm position is with one hand above the belly and another hand below the belly, as seen in the image above. This helps emphasize the baby bump while slimming down the curviness of mom's body. You can further emphasize the baby bump by having mom wear a gown that's sheer to give a full view of her belly. But don't get locked into just one arm position. 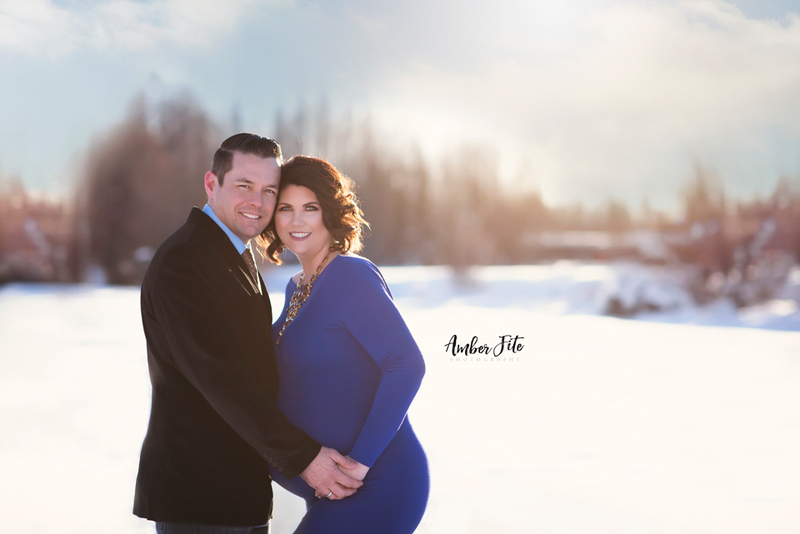 Try several photos in which the model's arms are up, down, or at different points on or near the baby bump so you can get the most flattering photos. Note in the image above how a simple placement of both arms below the baby bump helps draw attention to the belly but also gives mom an opportunity for a sweet, intimate shot in which she's cradling her baby-to-be. In the end, there's plenty of things you can do to make an expecting mom look and feel her best. Give these four basic tips a try, and see just how much impact they can have on the photos you create!